November 22, 2009 Dan O. If only it was six degrees of Kevin Bacon, then this would have been a 10/10! Paul (Will Smith) is a charming and engaging young con artist who appears one day on the doorstep of Flan and Ouisa Kittredge (Donald Sutherland and Stockard Channing). Professing to be a friend of the affluent couple’s son, Paul spins a tale of celebrity and despair that deeply affects the pair and their socialite friends. This film is based on the stage play by John Guare, which actually was inspired by a true story itself. Now I know the original story, and I was not very disapointed with this adaptation one bit. The one thing about this film that planned out really well was how it was told. Most of it through flashbacks and narration from families who experienced Paul the con artist. They narrate and show you how each and every little situation all relate to each other, and I never lost track of what happened. I just felt like the film didn’t quite have as much humanity to it as the film tried to bring up. These characters didn’t seem so real in their actions and by the way they talked. We also never really got to know them real well, other than their just a rich couple, and are having problems with their children. I also didn’t like how the con artist was reflected in a very negative light. Though he was doing crimes, I’ll say that, but he was the one who brought these people to realize who they were and he was like the patron for having them realize it. All the rich people were made to look all glamorous with the occasional problems, while Smith was looked at as just a perv among society. The film is uptight and the dialogue is often delivered with the flare of an old classic. The lines are witty, sharp, delightful and the gay stuff is fake near laughable. I enjoyed how the film did a real great job at combining comedy with drama, and making the film a lot more compelling than what it seemed to be. Stockard Channing naturally holds the film in place but her screen presence is so big and the camera is so small. Channing has to keep moving in order to stay in the film. However, by the middle of the film you begin to feel Channing’s break away from the theater and she delivers her lines with the grace of a Hollywood star. But, Will Smith probably has one of the greatest performances of his career in this film. It must have been hard for him to play a gay man, but he was so believable and genuine in it, that I almost forgot this was Will Smith I was talking about. 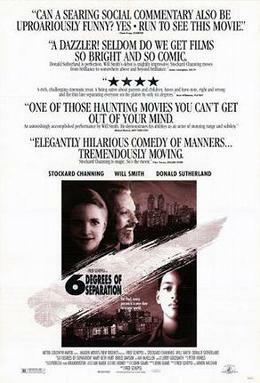 Consensus: A funny and moving drama with some great satirical messages about society, Six Degrees Of Seperation is moving but doesn’t feel too humane.